آقایی, مجید, رضاقلی‌زاده, مهدیه. (1395). بررسی عوامل مؤثر بر حجم مطالبات معوق و سررسید شده شعب منتخب بانک سپه. فصل‌نامه مطالعات مالی و بانکداری اسلامی, 2(بهار و تابستان), 95-111. مجید آقایی; مهدیه رضاقلی‌زاده. "بررسی عوامل مؤثر بر حجم مطالبات معوق و سررسید شده شعب منتخب بانک سپه". فصل‌نامه مطالعات مالی و بانکداری اسلامی, 2, بهار و تابستان, 1395, 95-111. آقایی, مجید, رضاقلی‌زاده, مهدیه. (1395). 'بررسی عوامل مؤثر بر حجم مطالبات معوق و سررسید شده شعب منتخب بانک سپه', فصل‌نامه مطالعات مالی و بانکداری اسلامی, 2(بهار و تابستان), pp. 95-111. آقایی, مجید, رضاقلی‌زاده, مهدیه. بررسی عوامل مؤثر بر حجم مطالبات معوق و سررسید شده شعب منتخب بانک سپه. فصل‌نامه مطالعات مالی و بانکداری اسلامی, 1395; 2(بهار و تابستان): 95-111. شبکه بانکی کشور همواره با مشکلی به­‌نام مطالبات معوق و سررسید شده روبه­رو بوده و این مطالبات معوق پیامدهای بسیاری نظیر کمبود نقدینگی و کاهش حجم اعتبارات را برای شبکه بانکی کشور در پی داشته است. با توجه به اهمیت نقش این مطالبات در سیستم بانکی کشور، در مطالعه حاضر به بررسی عوامل بانکی و اقتصادی مؤثر بر حجم مطالبات معوق و سررسید شده شعب مختلف بانک سپه در قالب الگوهای پانل دیتا طی دوره زمانی 1383 تا 1393 پرداخته شده است. نتایج به‌­دست آمده حاکی از این است که متغیرهای بانکی شامل کل تسهیلات اعطایی، شاخص ریسک، اندازه شعب و متغیرهای اقتصادی شامل نرخ سود تسهیلات و نرخ تورم دارای تأثیر مثبت و معنی­داری بر افزایش مطالبات معوق شعب مختلف بانک سپه در طی دوره مورد بررسی می­‌باشند، در حالی که نرخ رشد اقتصادی تأثیر منفی و معنی­دار بر حجم مطابات معوق بانک سپه داشته است. The banking system in Iran has always been faced by non-performing loans. Non-performing loans have many consequences such as the lack of liquidity and reduction in the volume of credits in Iran’s banking system. Based on the importance and the role of the non-performing loans in the banking system, this study investigates the impact of some banking and economic factors affecting on them in various branches of Sepah Bank in the framework of panel data in the period of 2004-2014. The results indicate that banking variable such as total facilities, risk index, and bank size and the economic variable such as loans interest rate and inflation rate have a positive and significant effect on the non-performing loans of Sepah Bank while economic growth has a negative and significant effect. 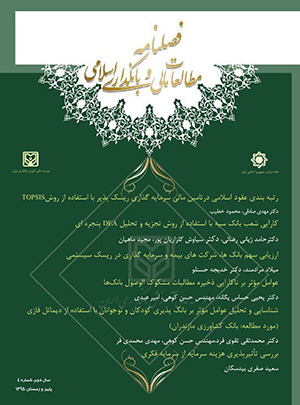 1- احمدیان، اعظم و آزاده داوودی (1391): اثر نظارت بانکی بر کاهش مطالبات معوق، فصلنامه حسابداری مدیریت، دوره 5، شماره 12. 2- اکرامی، محمود و آزاده رهنما اسکی (1388): بررسی عوامل مؤثر در مطالبات سررسید گذشته و معوق بانک، پژوهشنامه اقتصادی، شماره 6، ویژه­نامه بانک. 3- حیدری، هادی، زهرا زواریان و ایمان نوربخش (1390): بررسی اثر شاخص‌­های کلان اقتصادی بر مطالبات معوق بانک­‌ها، پژوهش­های اقتصادی، دوره 11، شماره 1. 4- رستمیان، فروغ و داوود طبسی (1389): بررسی عوامل مؤثر در ایجاد مطالبات معوق بانک‌­های تجاری مناطق آزاد تجاری- صنعتی (مورد مطالعه شعب بانک ملت منطقه آزاد کیش)، پژوهش­های حسابداری مالی و حسابرسی (پژوهشنامه حسابداری مالی و حسابرسی، تابستان 1389، دوره 2، شماره 6. 1- Ahmad, A.S., Takeda, C. and Thomas S., (2009): Bank loan loss provisions: A reexamination of capital management, earnings management and signaling effects’, Journal of Accounting and Economics, Vol. 28, No.1, pp. 1-25. 2- Babihuga, R., (2007): Macroeconomic and nancial soundness indicators: An empirical investigation, IMF working paper, No.115. 3- Boudriga, A, Boulila, N and Jellouli, S. (2009): Does bank supervision impact nonperforming loans: cross-country determinants using aggregate data?, MPRA Paper No.18068,Octobr 2009. 4- Barth, J.R., Caprio, JR.G. Levine, R. (2012): Bank Regulation and Supervision: WhatWorks Best?, Journal of Financial Intermediation, Vol.13, pp. 205-248. 5- Barth, J.R., Dopico, L.G., Nolle, D.E. and Wilcox, J.A. (2012): Bank safety and soundness and the structure of bank supervision: A crosscountry analyses, International Review of Finance, Vol. 3, No. 3-4, pp. 163-188. 6- Boubakri, N., Cosset, J.C. and Guedhami, O. (2008): Postprivatization corporate governance: The role of ownership structure and investor protection, Journal of Financial Economics, Vol. 76, No. 2, pp. 369-399. 7- Breuer, J.B. (2009): Problem bank loans, con_icts of interest, and institutions, Journal of nancial stability, Vol. 2, pp. 266- 285. 8- Castro, Vítor (2013): Macroeconomic determinants of the credit risk in the banking system: The case of the GIPSI, Economic Modeling, 31, 672-683. 9- Da Silva, Marcos Soares, Divino, Jose Angelo (2013): The role of banking regulation in an economy under credit risk and liquidity shock, North American Journal of Economics and Finance, available at SciVerse ScienceDirect. 10- Demirguc-Kunt, A., Detragiache, E., and Tressel, T. (2008): Banking on the Principles:Compliance with Basel Core Principles and Bank Soundness, Journal of Financial Intermediation, Vol. 17, No. 4, pp.511-542. 11- Pasiouras, F. (2008): International evidence on the impact of regulations and supervision on banks’ technical ef_ciency: An application of two-stage data envelopment analysis, Review of Quantitative Finance and Accounting, Vol. 30, pp. 187-223. 12- Pasiouras, F., Gaganis, C. and Zopounidis, C (2006): The impact of bank regulations, supervision, market structure, and bank characteristics on individual bank ratings: A cross-country analysis, Review of Quntitative Finance and Acconting, Vol 27, No 4, pp 403-438. 13- Ngurah, I. Gusti, Mandala, Narindra, Nawangpalupi, Catharina Badra, Rian Praktikto, Fransiscus (2012): Assessing Credit Risk: An Application of Data Mining in a Rural Bank, Procedia Economics and Finance, Volume 4, Pages 406–412.